Syeda is a 8-year-old with aggressive blood cancer. She was diagnosed in 2015 and despite treatment for a year, her cancer relapsed. In the time that she has been sick, her family has been evicted twice due to not having money for rent. But the family wants to continue Syeda's treatment and get her the bone-marrow transplant that will save her life. Syeda is sick of being in the hospital. Suffering from the side-effects of her medicines, she keeps asking her mother when they will go back. She wants to go back to her house in Mysore and eat home-made food that her mother made on holidays. In the strange, sanitised hospital, Syeda repeats her desire to go home like a mantra. What her parents have not told her is that the home she remembers – has been relocated again. It had happened first during her cancer treatment in KIDWAI. Her parents were in Bangalore for the treatment. When they went back home after 8 months of treatment, the landlord had locked them outside. They have been evicted once again, but this time the situation is even more dire. Humeira has spent much more for Syeda's treatment. 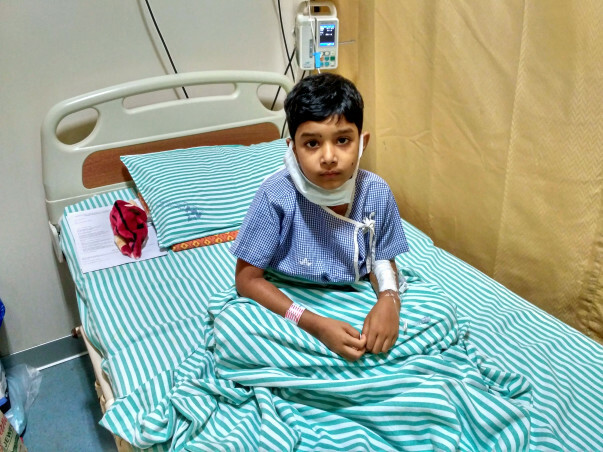 The family that lives a hand-to-mouth existence as it is, has spent Rs 4.5 lakhs on the treatment so far. 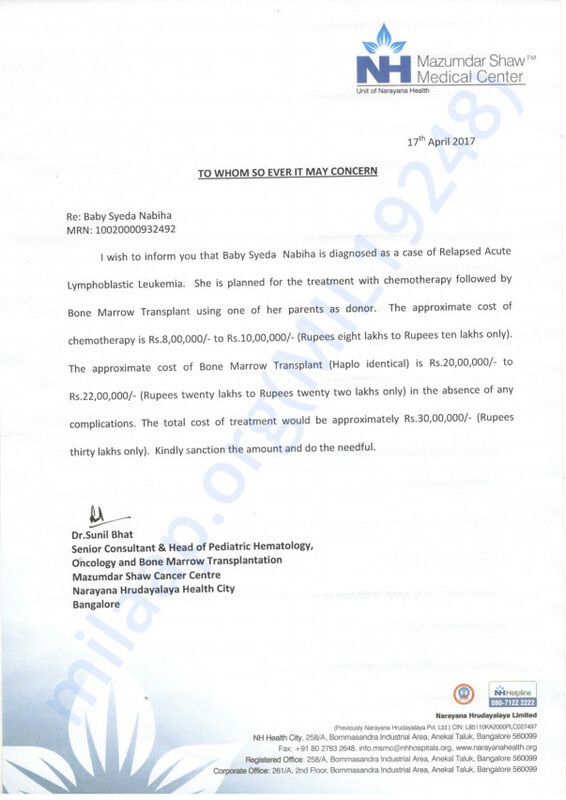 They can't imagine where they will get the 30 lakhs needed for the bone-marrow transplant. It gives us immense pleasure in informing you all that Syeda is doing well now. She is 11 months post transplant and is recovering well. It is heartening to see her getting better. She regularly goes for checkups. Thank you everyone! It means a lot to us. Thank you for all the support. We could not have helped Syeda without your support. We have some good news to share with you today. Syeda's transplant was done on the July 15th. It was a successful transplant and she is doing better now. Her follow up has started from today and a few tests will be conducted for a period of three days. I am Debotri, a fellow at Milaap. Here is an update on Sayeeda's treatment. I spoke to her mother, this morning. "From the 1st June, Sayeeda was admitted to the hospital. She underwent a chemotherapy for the last 7 days after which she got discharged today. Currently she is doing good and has improved a lot", said the mother. After 5 weeks from today, the BMT procedures for Sayeeda. Please share her story and help her to fight the battle. Thank you once again for your support and contribution. We will keep you posted on his progress.